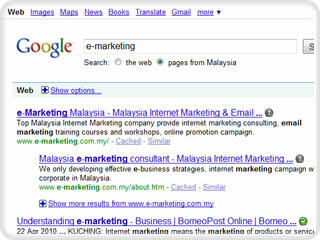 Our professional Malaysia SEO Consultants, SEO Copywriters and Web Designers based in Kuala Lumpur, Malaysia use a variety of methods to achieve high rankings in natural search engine results. A combination of Content Management System CMS and best practice Search Engine Optimisation (SEO) techniques keep our clients among the most visible on the Internet. Guaranteed Google Top 10 Ranking and Top 10 Ranking on Yahoo and Bing Search Engines with money back offer.